Thanks to a stock forum I discovered that John Hempton from Bronte is issuing a monthly letter for his Australian fund (H/T qed1984). The last one about China is brilliant. An interesting article about a Whistleblower at Halliburton with some insight into the arcane world of “revenue recognition”. AerCap Holdings NV (ISIN NL0000687663) – How good is Einhorn’s new favourite ? 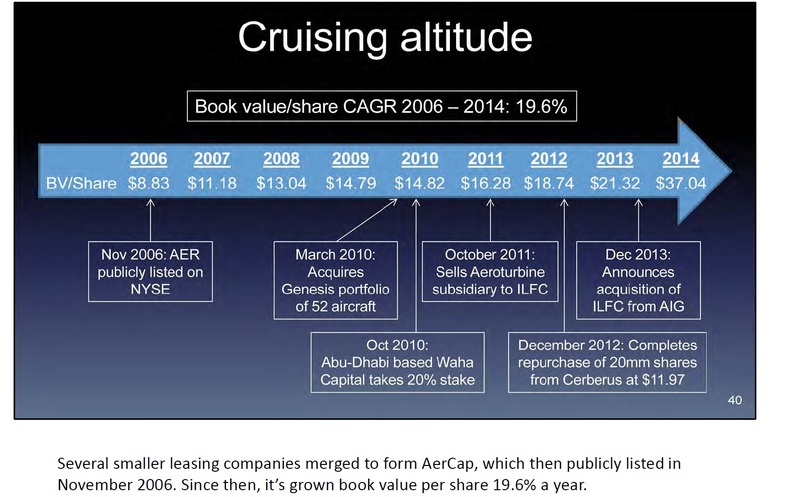 A friend forwarded me the latest presentation from “guru” David Einhorn where his main long pick was AerCap, an Airplane leasing company. Well, Airplane leasing is essentially a “special purpose lending business” without an official bank license, one could also say it is a “shadow bank”. What Aercap essentially does is to loan an airplane to an airline. In order to make any money at all, they have to be cheaper than the simple alternative which would be the airline gets a loan from a bank and buys the airplane directly. As Airlines are notoriously unprofitable and often thinly capitalized, they often need to pay pretty high spreads even if they borrow money on a collateralized basis. As any lessor funds the plane mostly with debt, the cost of debt is one important factor to make money compared to competitors. It is therefore no big surprise that GE with its AA+ Rating is the biggest Airplane leasing company in the world and that ILFC thrived while AIG was still AAA and had comparably low funding cost. A second aspect is also clearly buying power. Planes have to be ordered many years in advance and the two big manufacturers want to be sure that they are getting paid. I assume a reliable bulk buyer gets better access to the most sought after planes and maybe even better prices. Prices for planes at least in my experience are notoriously intransparent. Nobody pays the official list prices anyway. I found this interesting article in the WSJ from 2012. When Airbus and Boeing Co. announce orders at the Farnborough International Airshow this week, they will value the deals based on the planes’ catalog prices—which no one pays. Airline executives, when pressed for details, will probably say they got “a great deal.” But actual terms will remain guarded like nuclear launch codes. The aviation industry’s code of silence on pricing is notable in this era of information overload. Thousands of people world-wide are involved in airplane purchases, yet few numbers spill out. That yields much mystery and speculation. But there are ways to estimate the range of discounts. An analysis of public data by The Wall Street Journal and interviews with numerous industry officials yielded this: Discounts seem to vary between roughly 20% and 60%, with an average around 45%. Savvy buyers don’t pay more than half the sticker price, industry veterans say. But deal specifics differ greatly. One reason for the secrecy surrounding all this, say industry officials, is psychology: Less-experienced plane buyers like to think they got a bargain and don’t want to be embarrassed if they overpaid. The safest approach then is silence. More-seasoned plane buyers also know that bragging about discount specifics would anger Airbus, Boeing or other producers and hurt the chances of striking a sweetheart deal again. Clearly, as a large “quasi broker”, Airline leasing companies seem wo have a chance to make some money in such a intransparent market. But it is really hard to pin down real numbers. It reminds me a little bit about how you buy kitchens in Germany where the system is pretty much the same. Everyone gets a discount, but no one knows what the “true” price looks like. So purely from the funding cost perspective, AerCap at the moment has a problem. Someone like Air France could easily fund a loan for an airplane cheaper than AerCap, so cutting out the middle man is basically a no brainer and even the smaller competitors could easily under price AerCap when they bid for leasing deals. On top of that, a lot of non-traditional players like pension funds and insurance companies want some piece of the action, as the return on investments on those leases are significantly higher than anything comparable. Even Asset managers have entered this market and have created specific funds for instance Investec. AerCap does have a positive rating outlook, so there is a perspective for lower funding costs. Just to give an indication of how important this rating upgrade is: On average, 10 year BB financial isuers pay 2,4% p.a. more than BBB financial issuers at the moment. The jump from BB+ to BBB- will not be that big but it would increase the investor universe a lot for AerCaps bonds. Credit-default swaps on the company climbed this month as global stocks tumbled and speculative-grade debt issuance all but evaporated. The cost reached as high as 663 basis points on Aug. 11, according to CMA, which is owned by CME Group Inc. and compiles prices quoted by dealers in the privately negotiated market. The contracts have held at prices that imply ILFC’s debt should be rated B2, according to Moody’s Corp.’s capital markets group. However if they manage to to get an investment grade rating and lower their funding cost, then it could be an interesting investment as funding is cheap and they do have access to a lot of new and sought after aircraft. Again, borrowing from Warren Buffett, with any leveraged company, management is extremely important. And one should clearly compare AerCaps valuation and risk/return to banks and not to the currently much higher valued corporates. AerCap is much more similar to a bank than anything else. This general valuation disconnect seems to be also one of major reason why GE announced the massive reorganization just 2 weeks ago. 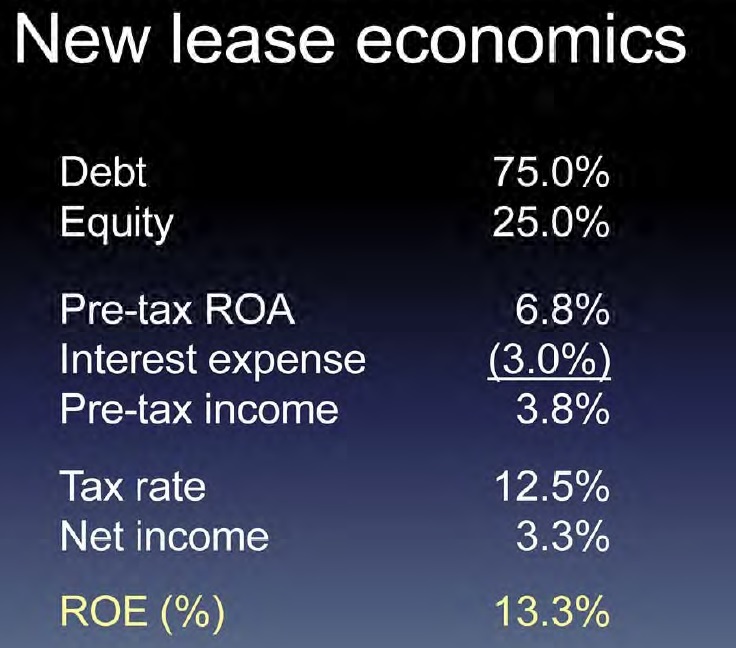 However, as far as I understood tehy will keep the leasing business as this is unregulated. Although I slightly disagree with the risk assessment of Einhorn’s case, I still think AerCap could be an interesting case and is worth to dig deeper. I don not have a problem investing into financial companies and I do like those “share overhang” situations. However, I will need to dig deeper and especially try to figure out how good AerCap’s management really is. (*) I did disagree with David Einhorn already once with Dutch Insurer Delta LLyod which was Einhorn’s long pick of the year 2011. Overall in this case I would put the score of MMI vs. Einhorn at 1:0 as Delta LLoyd did not outperform. TGS Nopec is one of my larger position which I bought back in November 2013 when oil (WTI) was still trading at ~100 US and the world looked great for oil and oil service companies. This is especially interesting as 2008/2009 for instance, TGS lost almost -70% when oil crashed back then. Almost always when I discussed TGS with other investors, the argument was like this: TGS is a great company but the price has to fall at least -50% or more as it did in the past. Well, for now they are holding up pretty well. I would recommend anyone to read the annual report, at least the one page letter of the CEO, which in very clear words describes how TGS operates. – however there were several negative one time effects included (around 65 mn USD or 60-65 cents per share). – interestingly they make no effort to adjust those one time effects. You won’t find adjusted numbers anywhere in the report. I like this VERY MUCH. Overall, they way TGS operates, 2015 will not look good from a P&L perspective, as they expense a lot of their investments and sales might take a little bit longer than usual. However if the past is any guidance for the future, in 2-3 years time the investments will then turn into nice profits down the road. The Cost Reduction Program will position the company for the more challenging seismic market caused by the significant drop in oil price. A key element of this program is a reduction of more than 10% of TGS’ global workforce effective from April. Restructuring charges of approximately USD 4 million will be booked in Q2 as a result of this Program. The company expects annual cost savings of approximately USD 10 million as a result of the Cost Reduction Program. (Bloomberg) — Offshore seismic market set for structural changes as oil producers rationalize costs, optimize upstream portfolios and concentrate on efficiency, Goldman says in note dated yday. So it seems that this time, TGS does get better credit for their countercyclical business model than in 2008/2009. Maybe investors have learned actually a little bit since then ?. In any case, from my side, TGS is a clear long-term core investment. Although the industry is very difficult, TGS is very good company with strong competitive advantages. Oil companies must replace their reserves,the demand for seismic data is not going away. Maybe it gets postponed a little bit ut they don’t have a choice. Without replacing reserves, atraditional E&P will not valued as going concern but as a run-off which much lower multiples. Even with the reduced forecasts, TGS is still very profitable and who know what opportunities show up if some of the competitors get deeper into problems. Is Google the next Microsoft ? This is the follow up post to the first post on Lloyds Banking group 2 weeks ago. Bloomberg) — Lloyds cut from buy on concern about outcome of U.K. election, probability of a “raft of negative one-offs in 2015” and on U.K. govt plans to exit its 22% stake, Investec says in note. For me, this is actually a good sign that a lot of the short-term bad news is on the table. But let#s look at the company now. The banking business is no favorite of ours. When assets are twenty times equity – a common ratio in this industry – mistakes that involve only a small portion of assets can destroy a major portion of equity. And mistakes have been the rule rather than the exception at many major banks. Most have resulted from a managerial failing that we described last year when discussing the “institutional imperative:” the tendency of executives to mindlessly imitate the behavior of their peers, no matter how foolish it may be to do so. In their lending, many bankers played follow-the-leader with lemming-like zeal; now they are experiencing a lemming-like fate. Because leverage of 20:1 magnifies the effects of managerial strengths and weaknesses, we have no interest in purchasing shares of a poorly managed bank at a “cheap” price. Instead, our only interest is in buying into well-managed banks at fair prices. 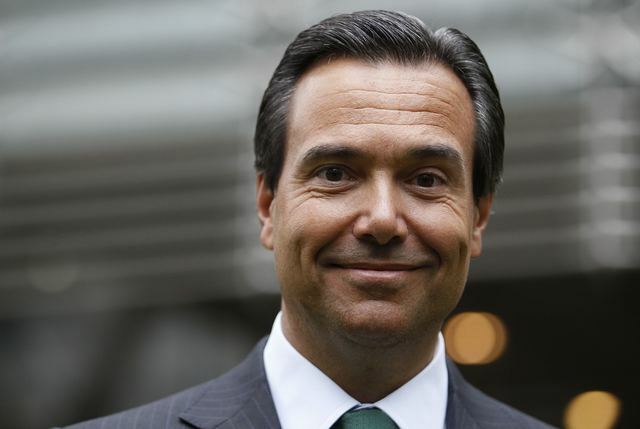 So let’s look at Lloyds Management. The CEO, Portuguese António Horta Osório is considered to be one of the “best bankers” in the business. He was appointed in 2010 and lured away from Santander, where he build up Santander’s quite succesful UK subsidiary. He became CEO in March 2011 but then something strange happened: He “disappeared” for around 6 weeks due to a “burn-out”. He cam eback however and actually did not take his bonus for that year. But how can one determine if he is really a good manager? Well, a first step would be to look at videos and interviews. As an INSEAD alumni for instance a quite interesting inerview with him can be found when he still was in charge of Santander UK. There are a lot of speeches and interviews found on Youtube from him, for instance here or here. Despite his “slick” look, he comes across as a rather thoughtful person trying to restore some kind of trust into the banking industry. – cost was reduced by 1.4bn, but cost income ratio was 50%. Overall, Orosio delivered on the cost side but failed to increase the “other income”. Additionally, he clearly underestimated all the PPI, Libor scandal fines etc. but this is outside of his control. One thing which annoys me a little bit that they basically dropped the ROE measure from their reporting. The are now reporting non-sensical numbers like “return on risk weighted assets” which IMO is a “BS number”. For a financial company, ROE in my opinion is “THE” measure of success in the long run and nothing else. So overall, I would give “good” marks to Horosia. I do think he is a great “operator” and maybe one of the bank “cost cutters” in the industry, but maybe not the one to create a lot of new business opportunities. I Estimate a target P/B multiple, target ROE and target retention ratio to come up with a potential return calculation. In Lloyds case, I assume that 12% ROE is a reasonable target to be achieved within the next 4 years. Other than for Handelsbanken, I think that Lloyds can only reinvest 25% at those rates and will pay out 75% of earnings. If my assumptions would turn out to be correct, over a 10 year period, Lloyds would return around 11% p.a. Not bad but worse than Handelsbanken. Selling after 4 years however would lead to a return of 14% which I find quite Ok. The difference comes from teh fact that I assume relatively low “compounding” which I think is realistic. What I do like about the risk/return profile is the fact that there is a kind of “soft put” at 0,736 GBP. This seems to be the break-even of the UK Government. I assume that if the price would move below that, they will lower their sales volume or stop sales altogether as they want to show a “profit”, which should support the stock price at that level. I think there could also be an interesting effect with regard to index weights. I am not sure how often index providers refresh their weights for instance for the Footsie, but there is most likely a time lag between the UK government selling and the index providers adjusting the weight. I know that for instance the DAX is only reweighted once a year which would then, in the caso of LLoyds would suddenly increase the amount to be bought by the index funds. In its current form, Lloyds is clearly not a growth/compounding story but rather a 3-4 year “special situation”. It similar to my 2 other “forced IPO” or “forced sales” investments Citizen’s and NN Group. So overall, I find it a quite attractive special situation. Banks in general are one of the last truly “cheap” sectors and I do think that Lloyds has most of its problems behind it, especially compared to its large UK peers. So despite the relatively high valuation, I do think Lloyds is one of the most interesting situations with large UK and European banks at the moment. Due to my position limitation however, this will get on the “queue” for the time being and decide by the end of the month if to buy, unless the price woul ddrop significantly. My buying limit would be around 79-80 pence/share.